questions from audiences (and presenters). Who shows you the future? I engage with clients in a variety of ways. I give keynote talks at conferences and events. I speak to boards and leadership teams, giving advice and provoking thought, or sharing skills through workshops. I write, producing reports, papers, and posts that form the core of content marketing campaigns. Tom acted as series consultant for the production of ‘In the Future’, a collection of shorts for Channel 4 looking at tomorrow’s world, presented by Tim Lovejoy. 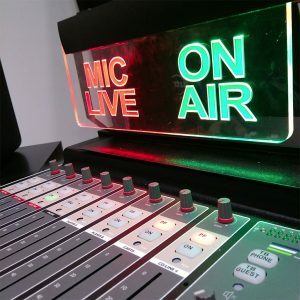 Tom hosts a podcast on the MCR Live network focused on technology and tomorrow. This podcast can be sponsored and branded, and redistributed through your own channels to provide you with original content of your own. In 2019, Tom worked with Virgin Media, part of Liberty Global, to launch a trial of ‘hyperfast’ fibre optic broadband delivering 10Gbps to homes in Cambridgeshire. The challenge? This is so much faster than today’s services that Virgin needed a futurist to explain what it might be used for. The launch was a huge success, with coverage in more than 50 media outlets including the BBC and The Sun. To book Tom or for for information on rates and availability, please complete this form and someone will get back to you as soon as possible. Content will still be hosted and produced by Tom but within the sphere of ‘technology and tomorrow’ themes can be tailored to suit your needs over a fixed-term run. Tom acted as series consultant for the production of 'In the Future', a collection of shorts for Channel 4 looking at tomorrow's world, presented by Tim Lovejoy. Tom also appeared in this episode, looking at the future of healthcare and the role that our homes - and our toilets - could play in keeping us well.